As a little blogger appreciation, I'm giving away these vintage Kate Spade sunnies. 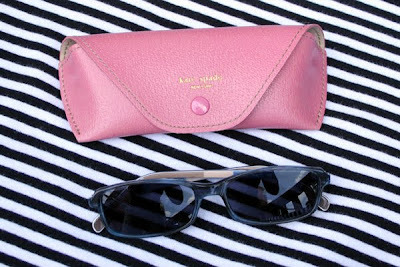 The style is calle Brice, and they come with this pink case. To enter, just be a follower and leave a comment. If you tweet or post about it or tell your mom, give yourself extra comments. Oh count me in please! I love these, unlike yucky modern curved ones. Just dashing off a handwritten letter to my Mom to tell her. Hold, on, I should probably put that in a different comment. Yes, as I was saying, such a lovely day. Such a joy to be here. Dum ti dum, fiddle di dee. Already a follower - does that count? hahah! you're too cute! "tell your mom" Of course I follow, and yes please enter me :) Hope you're having a fabulous summer! 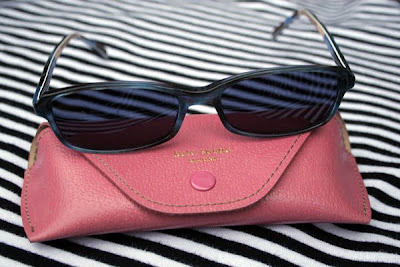 Love the shades and the cute pink case! Ooooohhhh! I most definitely need these and I love the little case!! Been a follower since day one and those are definitely my style....love the pink case too although would be perfect in purple. I already follow you and all of your goodness. Just in case you don't see the comment I made a few posts down..thank you again for posting about the copper DIY table..perfect timing. I just became a follower. Looking forward to visitng your blog more often. As you can tell by my profile pic, I am a glasses wearing gal - 100% of the time. Would love to own these (love the case too)! Very generous. I'm a big follower and would looooove these! yay! i love your originality! Enter me to win! Love!